A consequence of the relentless success of the scientific method is that occasionally, a sub-discipline of science will stagnate. This rarely results in complete abandonment of a field (as in the case of say, astrology), and more commonly results in a phase of slower progress, where many of the interesting problems have been solved and additional research yields diminishing returns. Such was the state of celestial mechanics—the study of motion of heavenly bodies under gravity—when Yoshihide Kozai decided to pursue this dormant branch of astrophysics. It is often said that celestial mechanics reached its peak in the 19th century, with the 1846 mathematical discovery of Neptune hailed as the field’s crowning achievement. A century later, the study of how solar system orbits change over time had largely faded into the background, with the development of more precise predictions of future motions of the planets remaining as one of the only practically important issues. With the advent of spaceflight, however, all of this was about to change. A diagram of the Luna 3 spacecraft trajectory, displaying the gravitational slingshot (gravity assist) around the Moon and the change in the spacecraft orbital plane. At a conference held in Moscow in late 1961, 33-year-old Kozai, who at the time was also working on understanding the orbits of artificial satellites, presented his research in the same session as Lidov, who was there to report on Luna 3. Kozai realized that the same type of orbital evolution that affected Luna 3 over its five-month lifetime can also unfold in the asteroid belt over thousands of years. That is, if an asteroid takes the place of the satellite, the Sun takes the place of the Earth, and the Moon is replaced by Jupiter, the physical setup of the problem is reproduced! Kozai described the discovery in a 1962 paper. A small mass—a satellite orbiting Earth, or an asteroid orbiting the Sun—can have its orbit perturbed by a distant, large mass—the Moon or Jupiter. The orbital eccentricity (non-circularity) and inclination (tilt) can seesaw, such that an initially circular but highly inclined orbit can in time lower its tilt into the plane of the perturber, at the expense of becoming highly elliptic. This phenomenon is now known as the Kozai-Lidov mechanism. In Luna 3's case, the orbit became so elliptic that, at closest approach to Earth, its orbit intersected Earth's atmosphere, dooming the spacecraft. Not all orbits will participate in this type of evolution, and a more involved analysis demonstrates that an initial inclination greater than about 40 degrees is required for a circular orbit to become unstable to Kozai-Lidov cycles. Kozai’s work received relatively little attention for the three decades that followed its publication. 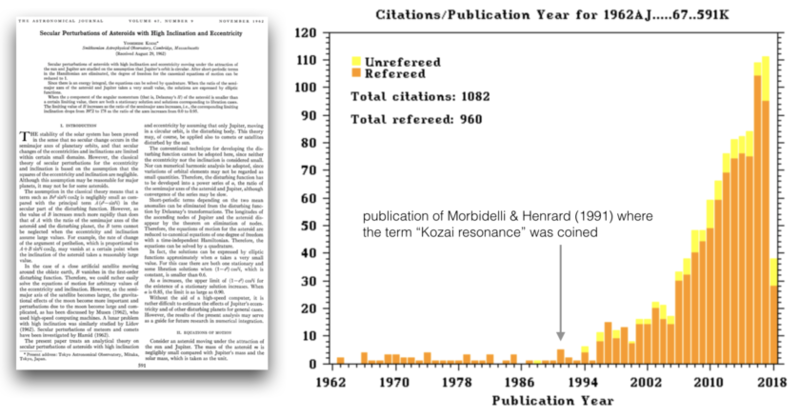 In 1992, the number of references to Kozai’s 1962 paper clocked in at 47 (in stark contrast to the 1000+ citations the paper has today). In the early 1990s, however, developments in computing power and the realization that asteroid orbits are chaotic (where their evolution can be very different for tiny changes in initial conditions) re-awakened interest in solar system dynamics. It was during this time-period that it became clear that the Kozai-Lidov effect is not just a mathematical curiosity for academics. Instead, the Kozai-Lidov mechanism turned out to be a fundamental dynamical process that has played an important role in shaping the solar system’s present-day structure. The Kozai-Lidov mechanism is at work in a surprising variety of environments. 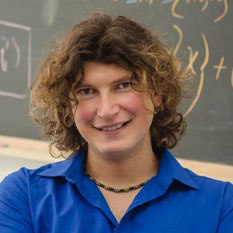 Over the last two decades it has been recognized that in binary star systems, Kozai-Lidov dynamics can conspire with tidal heating to turn garden-variety Jupiter-like planets into exotic “hot Jupiters.” At an even larger scale, in conjunction with gravitational waves, the Kozai-Lidov effect can facilitate mergers between black holes. Indeed, today the Kozai-Lidov mechanism stands out as one of the most actively studied processes in astrophysics. Yoshihide Kozai’s academic legacy extends beyond scientific research alone. In 1981, he took up the position of Director General of the Tokyo Astronomical Observatory, and continued on as the founding Director General of the National Astronomical Observatory of Japan. Additionally, he served as the President of the International Astronomical Union from 1988 to 1991. Among other honors, Kozai was awarded the Imperial Prize of the Japan Academy in 1979 and AAS Division of Dynamical Astronomy Brouwer Award in 1989. Having completed 89 orbits around the Sun as of February 5th of this year, Dr. Kozai is no longer with us. However, his incredible insight into the evolution of orbits interacting under gravity remains, and never fails to inspire. The journey to understanding the enchanting motion of heavenly bodies, on which Kozai helped pave the way, continues. In celestial mechanics, the Kozai-Lidov mechanism is a dynamical phenomenon affecting the orbit of a binary system perturbed by a distant third body under certain conditions, causing the orbit's argument of pericenter to oscillate about a constant value, which in turn leads to a periodic exchange between its eccentricity and inclination. If you are interested in learning more about the math involved, read on. In order to get a basic understanding of the mechanism, we begin by making a few approximations. We assume that the orbital periods of the small body (the satellite or asteroid) and the perturbing body (Moon or Jupiter) are uncorrelated. That means the ratio of the two periods cannot be expressed as a simple ratio of two nearby integers. When this assumption is satisfied, we can invoke the “secular” approximation, where we imagine that the masses of the bodies are smeared along their respective orbits, like two wires. Instead of the mathematically difficult problem of solving for the motions of interacting particles, we are left with a simpler problem of computing the motions of massive wires that exert gravitational pull on each other. We can make two more approximations to simplify the problem further. We ignore the small orbital eccentricity of the perturbing body (Moon or Jupiter) and the minuscule mass of the small body (satellite or asteroid). Then all the mass in the problem is in the same plane, and is symmetrically distributed around the central body. Noether's theorem tells us that symmetries in nature generate conserved quantities (conservation of energy, or of momentum, or so on). In this case the conserved quantity turns out to be the component of the angular momentum perpendicular to the orbital plane of the perturbing body (Moon or Jupiter). Expressed in terms of orbital elements, this quantity is proportional to the product of the orbital minor axis and the cosine of the orbital inclination with respect to the plane of the perturber. The conservation of the integral of motion is the essential feature of Kozai-Lidov cycles. Without violating the conservation of the vertical component of the angular momentum, orbital eccentricity and inclination can exchange, shifting the orbit. Interesting article, though I was rather nonplussed at the reference to astrology as a scientific field when it's nothing of the kind and never has been. @ToSeek: Of course it was. Throughout most of its history astrology was considered a scholarly tradition and was common in academic circles, often in close relation with astronomy, alchemy, meteorology, and medicine. Source: "Stars, spirits, signs: towards a history of astrology 1100–1800". Studies in History and Philosophy of Science Part C: Studies in History and Philosophy of Biological and Biomedical Sciences. 41 (2): 67–69. doi:10.1016/j.shpsc.2010.04.001.